Leah (Lee) Foster peacefully passed from this life in her home in Golden, CO on February 26, 2019. Those she has to leave behind are her husband, Warren, her son, Todd, her daughter, Corrie, and her five grandchildren; Brandon, Kayla, Alyssa, Brianna, and Madison, as well as, all of those who loved her. Lee and Warren would have celebrated 63 years of marriage this August. Warren, her children, and grandchildren will miss her very much. Lee was born in Plainview, NE to Leo and Thelma Steinkraus on February 19, 1934. She graduated from Plainview High School in 1952. Lee was one of four girls; her sisters being Gwyneith, Phyllis, and Betty. Lee loved music at a young age and earned an Associate’s Degree in Music from Christian Female College in Columbia, MO in 1955. She often referred to her time at college as some of the best years of her life. While in college, she recorded music which became an experience she forever held treasured in her heart. Her recordings will be played at her celebration of life service in honor of her memory and accomplishments. Lee and Warren were married in 1956, and they lived in student housing at the University of Nebraska until Warren graduated in 1961 with a Bachelor’s Degree in Architecture. Warren and Lee then moved to Colorado where they raised their family. To continue her love for music, she was the founder/director of the East Denver Chorus for many years. She hand-made all the performance gowns for the chorus members and spent countless hours choosing just the right music for numerous performances across the Denver area. 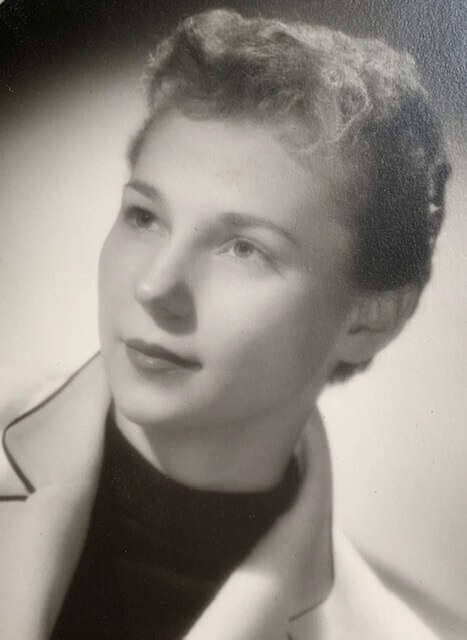 In addition to directing, she was a homemaker, taught piano lessons, and was an office manager for her husband’s architectural firm until well past retirement age. People were drawn to Lee’s kindness, compassion, creativity, and strength. That strength carried her to become a breast cancer survivor. In addition to her love for music, she enjoyed reading and was an avid crafter. Lee enjoyed crafting so much that there was always a room in the house known as “the craft room”. Occasionally, she sold her crocheted afghans and crafts at local craft fairs, but mainly she crafted for her own enjoyment to express her creative nature and gave them as gifts to family and friends. Lee is now home, and may she be at peace. Visitation will be on March 8, 2019 from 2:00-3:00pm, Horan & McConaty, 3101 S. Wadsworth Blvd. A celebration of Lee’s life will be on Saturday, March 16, 2019 at 2:00pm with a church reception following the service, Lakewood United Church of Christ, 100 Carr Street. May Leah’s soul rest in peace. Many happy memories of my friend at Plainview High School, class of 1952. I especially have fond thoughts of Leah in the music department. Leah’s voice was a treat to hear and appreciate. Leah will be greatly missed by all. Sincere sympathy to the Warren and family. Lee was a great friend. I will miss her dearly. My deepest condolences to the friends and family of Leah. May your treasured memories bring you joy, and may ‘the God of all comfort’ give you strength, along with a measure of peace for your grieving hearts at this most difficult time.